From Mary Swan, the bestselling author of the Scotiabank Giller finalist The Boys in the Trees, comes a dazzling and intricate new novel that tracks one family across 150 years, unearthing long-buried secrets and capturing moments that reverberate unexpectedly across the generations. 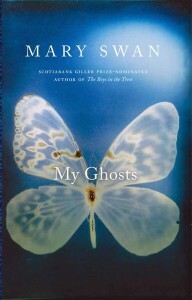 In My Ghosts, with an uncanny eye for the telling detail, Mary Swan brings to vivid life a household of Scottish orphans trying to make their way in Toronto in 1879. The youngest, Clare, has rheumatic fever; the oldest brother has run away. The fate of them all rests on the responsible Ben, the irrepressible Charlie and the two middle sisters: Kez, sarcastic with big ears and a kind heart, and Nan, benignly round but with a hidden talent for larceny and mischief. Fascinating lives spool out from these siblings: a cast of indelible strivers and schemers, spinsters and unhappy spouses, star-crossed lovers and hidden adulterers, victims of war and of suicide—proof of how eventful the lives of “ordinary families” can be. Swan leaves us with the contemporary Clare, widowed and moodily packing up her house. She isn’t sure what she’ll do next, and she knows nothing of her family’s past. But we do: we recognize the ghosts and echoes, the genetic patterns and the losses that have shaped her as much as her own choices and heartbreaks. My Ghosts is entrancing fiction that pulls you into its characters’ lives at the same time as it inspires you to think about your own ghosts, your own forgotten past.